Lostine, Oregon is a scenic farming town nestled between Wallowa and Enterprise in the Wallowa Valley, with the majestic Wallowa Mountain Range serving as an enchanting backdrop. With a little over 200 people residing in this charming little hamlet, the acres and acres of farmland are truly a relaxing escape. Lostine's various farms and crops add to its picturesque nature. Driving into town, you're sure to see one of the many herds of sheep. You may even see a llama named Harvey, right in the middle of the herd, acting as the sheep's "watchdog." 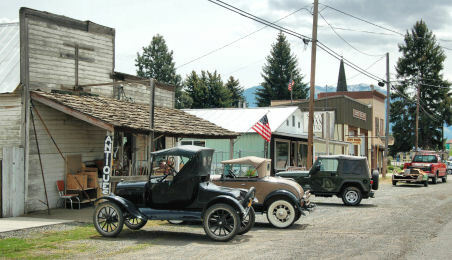 Lostine's longest standing tradition is the Lostine Flea Market, which occurs the first weekend in July. More than 70 faithful vendors come from all over the United States to line both sides of the main street and some of the side streets, selling various odds and ends. You never know what you're going to find! The Lostine River Run is also the same weekend and participants choose between the 10K, 5K and 1 Mi. course. Besides the flea market, people also come out of the woodwork in droves for Taco Night on Wednesdays at the old Lostine Tavern. All it takes is a flour tortilla, some cooked hamburger meat, lettuce, cheese and two different types of salsa to bring the town together. The evening acts as a social, bringing everyone together to visit and laugh. It's the perfect night to get a feel for this otherwise quiet town. The Wallowa Valley has a rich history dating back to the turn of the century, Lostine is no exception. A man by the name of G.E. Laughlin settled in what is now known as Lostine in 1878. He built a small cabin and in that same year a post office was established, as requested by all of the settlers coming to the area. Laughlin was appointed the postmaster and named the town Lostine after his former residence in Lostine, Illinois. He left soon after and his wife, Mrs. Laughlin, acted as postmistress for many years. As the community grew, many small businesses opened and thrived, largely in part to the Joseph & Elgin Stage Line that passed through. The inhabitants had all they needed with the general stores, drug store, hotel, butcher shop, tin shop, livery barn, millinery, blacksmith shop, boarding house, mill, planning mill, and sawmill. Lostine was incorporated in 1903. Lostine Tavern. 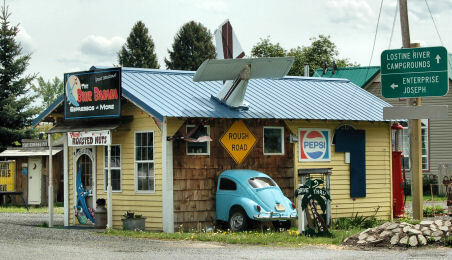 125 Hwy 82, Lostine, OR 97857. Phone: 541-569-2246. The Blue Banana. 143 Hwy 82, Lostine, OR 97857. Phone: 541-569-2400.